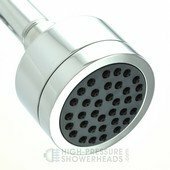 Dissatisfied with your current shower head and lousy pressure? Then you're at the right place! Twelve years ago we began the search for the the best high pressure shower heads on the market, testing dozens of shower heads from many manufacturers. Our testing focused on one attribute: High Pressure. 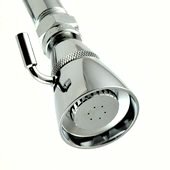 So what makes a great high pressure shower head? Not a high price. Not a "status" name. Definitely not whooshing air or some "new technological breakthrough". What matters is excellent stream control, the right number of streams, and an internal design which minimizes blockages. The bad news is that you can't determine these without testing. The good news is that we've done the testing and found the best! 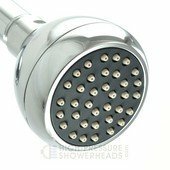 Great shower heads become harder to find each year, but they are still available! And be sure to check out our flow photos! Our shower heads can be found in many exclusive spas, exotic resorts, and boutique hotels around the world, and in the locker rooms of many professional sports teams and top athletic clubs. Get yours today! Exceptional pressure and a great new look. Amazing pressure in an affordable and great looking shower head, plus soft rubber nozzles for easy cleaning in hard water areas, and all with the highly desired full-face spray pattern. Chrome ABS body, solid brass ball joint swivel, removable flow restrictor, light gray composite face, dark gray soft rubber nozzles, 4.0"w x 3.0"h.
The Ultimate high pressure shower head! It's small, but it packs a punch. For years, this was the most powerful shower head we'd ever tested. Highly adjustable spray, excellent pressure, great stream patterns. It's the Ultimate! Great pressure and nearly a pound of solid brass. This shower head may look like many others on the market, but it provides the best pressure we've found in this full-size traditional style. 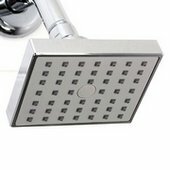 Identical to the Ultimate shower head (above) but in a larger size. 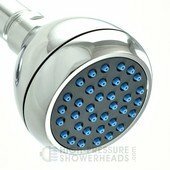 A powerful and attractive shower head offering great pressure and superior construction. The body, plunger and handle are all chrome-plated solid brass. Its exceptionally good plating and machining provide a beautiful finish, and the spray is adjustable from coarse to fine to suit all family members. Also available in Brushed Nickel, Polished Brass and Oil-Rubbed Bronze (click here). 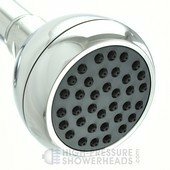 The Supreme, Moda and Forza (below) are the highest pressure shower heads we've ever found (they're the same internally). The Supreme is a superb shower head with an attractive design and great performance. It is very well made - the body alone is 14 ounces of solid cast brass. It's full-face spray pattern is very rare in a high performance shower head and ensures even coverage. Soft rubber nozzles provide for easy cleaning in hard water environments. Same awesome pressure as the Supreme in a stylish new body. This incredible shower head features the same all-brass internal construction of the Supreme in an even heavier body. Each shower head contains more than 1 pound of solid cast brass and provide the same high pressure as the Supreme. The Moda, the Supreme (above) and Forza (below) provide the highest pressure we've ever found. Its full-face spray pattern ensures even coverage. Soft rubber nozzles provide for easy cleaning in hard water environments. Same amazing performance as the Supreme and Moda (above) in a new clean design that's bold and contemporary. Can serve as a stylish update to any shower, or hold its own as the focal point in the most luxurious bathroom. The body is even heavier than the Moda above, with more than 1 lb of solid cast brass. But the looks don't matter if the pressure is weak and the Forza, the Supreme and the Moda (above) provide the highest pressure we've ever found. Full-face spray pattern ensures even coverage. Soft rubber nozzles provide for easy cleaning in hard water environments. Chrome-plated solid brass body and ball joint swivel, composite face, rubber nozzles, full-face spray pattern, removable flow restrictor, 2.5"d x 2.6"h, chrome finish. 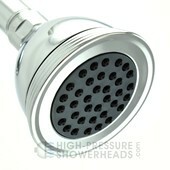 The "Perfect" shower head - A great high pressure shower head at a great price. Chrome ABS body, solid brass ball joint swivel, removable flow restrictor, chrome finish. By comparison, most typical shower heads score between 50 and 70, and some as low as 35. The key is that each of our shower heads is at the very top of the range of what's currently available (and we've tested dozens!). So order yours today!